One of the first challenges to boat building on the second floor is getting the materials into the loft. Specifically, the 40 odd sheets of 4′x8′ marine plywood that are used as the core material of the vg23’s composite hull. I spent hours contemplating a method to easily get the sheets up and down from the loft and finally settled on a simple pulley mechanism which seemed to do the trick. One sheet of plywood at a time. I’m not the most patient of people and after hoisting 5 or 6 panels into the loft it was gently pointed out to me that the front-end loader on the tractor could reach to the height of the hayloft. An hour or so later the plywood was safely stacked in the loft and my rope and pulley system hasn’t been used since. I took it as a perfect lesson in over thinking a problem and have made a point of not repeating that kind of waste of time and energy again. While I was building the basket mold in which the vg23’s hull is constructed I also cut, coated with epoxy and spliced the side and bottom panels from the plywood sheets. I’d never worked with marine plywood before and really found the meranti I’d bought nice to use. Each piece should be saturated with a coat of epoxy in order to give it a little extra resistance to moisture absorption. As well, by pre-saturating the wood in this way the laminations of fibreglass that come later will bond better and cure stronger. This is especially important in getting good strong seams. 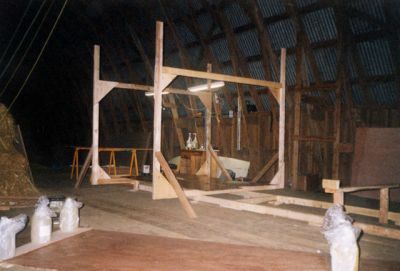 All the panels on the vg23 are assembled from three lengths of the plywood so after cutting each section to the specified shape I lay them out on the hayloft floor and spliced them together on both sides with a strip of 12oz biaxial fibreglass tape. You can see one of the side panels in the foreground of this photo, with jugs of epoxy used a weights on the splices while the fibreglass cures. Her art is amazing. It is so real lokniog. As an artist, I know how tedious it is putting a lot of detail into my art, but Patricia goes way beyond detail. Amazing.